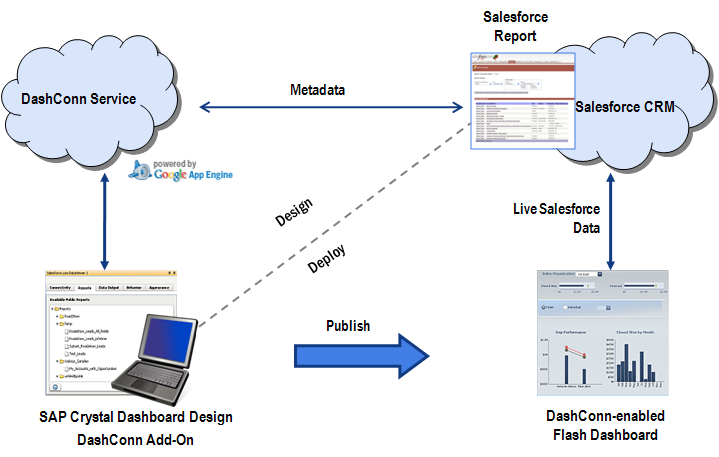 The DashConn Add-On for SAP Crystal Dashboard Design/Xcelsius greatly simplifies the process of creating interactive analytical dashboards with live access to Salesforce CRM data. The process begins when a designer – typically a business analyst or IT person – drag-and-drops a DashConn Add-On component onto the SAP Crystal Dashboard Design design-time canvas. DashConn’s intuitive point-and-click property sheets are then used to select an existing Salesforce CRM report to use within the dashboard and to configure other behaviors. This step can then be repeated to add additional Salesforce CRM reports to the dashboard. Once other elements such as charts, maps, and selectors have been inserted into the dashboard and the design is complete it may be published in one of several output formats. Options include publishing the dashboard as an independent Adobe Flash (swf) or AIR file, or embedding the Flash within several common desktop application file formats. 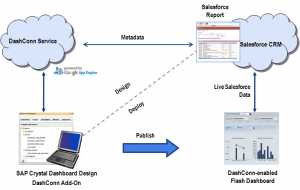 Flash files can be referenced within html files and deployed on company intranets or portals or embedded within Visualforce pages and deployed on the Salesforce platform. Note that the DashConn Add-On obtains information about the report via the DashConn service. This service is deployed within Google App Engine removing the need for any on-premise server.